There are many families that have suffered when a daughter does not return from a ministry. They are, what is becoming known as "Big Grief" ministries. The organization claims to be helping young adults turn their hearts to the parents, but they do not. The daughters are a great help to these ministries and it is amazing how hard they will fight to keep them there. After 6 months to a year has gone by, (in some cases, several years) and their daughters have still not returned, parents begin to suspect that something is wrong. They write, email, phone, and even visit, but cannot get their daughters out. The Big Grief ministries will not send them home, and there is a reason. These ministries are often state funded, so they have the state on their side. They cooperate with the state in institutionalizing troubled youth in youth centers around the world. Those kids who are not exactly troubled, but who the parents want to be trained in helping troubled youth in order to mature them and see the effect of their own behavior, are used as "staff." Once on the staff, they do a certain amount of work in the kitchen, or other areas, and help in teaching various things. It gets harder and harder to get them out because staff is so valuable. It may be free room and board in exchange for such services. The parents still insist on the return of their daughters, and have to go through many channels, clear up to the headquarters of such ministries, in order to negotiate their release. I know you are thinking how ridiculous this is, but remember how I said that it was also state funded? These B.G. ministries, which bring enormous grief to parents, will, in cooperation with the state, administer any kind of psychological testing, or just let a minister judge them himself, to determine if the parents are "abusive." Abuse can be anything that parents do, fron saying "no" to getting upset when the child is out all night. Once the label of abuse is given to the parent, it begins an entire new set of problems. Psychology now labels just about any thing the child is "uncomfortable" with as abuse. I heard of one girl who claimed her parents wanted her to clean up her room before she got dessert. She always remembered that terrible day she went without dessert. Another young adult stated that her motehr forced her to stand still while she took family photos, and when she didn't, she frowned at her. This girl, and others like her, dredge up any old thing to interpret as "abuse." Once that label has been given to the parents, the state is on the side of the ministry. If the minister or ministry says that the parent is "irresponsible" or "abusive" you cannot get that child away from that ministry.Now, the minister claims to protect the son or daughter. Meanwhile, at home, the fathers may stand to lose their livelihood or businesses because of this false accusation . It is actually against the law to accuse anyone falsly of "moral turpitude." It is called "defamation," and is a crime. Yet ministers get away with it by call thing parents "ABUSIVE." I have known parents who have lost their sons and daughters to these B.G. ministries and would like to first of all warn everyone not to run to ministries when your young adult children give you problems. There was a time, "in the old days" when parents did not spread their troubles around. They handled them at home. Today, they have been made to think that a minister will help them. He will not.He will let your daughter stay in his ministry, and then when you think she has been there long enough, and start putting pressure on the B.G. minister, he will shuffle the daughter off to someone else in ministry, some other youth center, or some other minister's family,but never the home. The state and the ministry are in cahoots, because they have a Freudian belief that all problems stem from childhood. The B.G. ministries do not follow the Bible; they follow the Freudian principles, and have reworded them to make them attractive to young people. One way that they frame the parents, is, during the phone conversations, they will tell them that if they release their daughter, their daughter will wander around without authority, get pregnant, assaulted, etc. The parent, still fighting to have their daughter returned, will tell them to send her straight home. Later, the B.G. ministry will accuse the parents of being "irresponsible" because they "didn't object to the daughter getting attacked." It is a twisting of words and intentions, but this will be used against the parents. Many years ago when I first started home schooling, I heard a lady tell a story of how the state tried to take her children away from her. She had an antique collection of swords on her wall as a decoration, and someone had reported her for it. When the mother went to the social workers to talk about it, one of the employees snatched her child, so the mother began to yell and scream and run down the hall, "HELP ME" and "THEY ARE KIDNAPPING MY CHILD"---and they backed down. There were other offices of a different nature in the same building, and the workers didn't like the noise and the attention, so they backed down and said,"I'm not touching anything, Mrs. Jones." The speaker then went on to say that the more noise you can make, the better it is. Many Christians are just nice peaceful people who do not want to come off looking like erratic, senseless, out of control mothers with no brains, so they remain silent. She said you have to make a big fuss. You can't let them get away with it. They will get away with it if they think they can. B.G. ministries are no different. If they think you have no resources, no recourses, no friends, no power, no money, and ow way to get your daughter back, they will play games with you for a long time and never return her. During the time they have her, they will indoctrinate her so badly that she will believe that she is only safe in their shelter. She will believe everything they say. They will monitor her email, her mail, and her phone conversations. Her parents will be treated like criminals and even recorded when they try to get their daughter to listen to reason. Going to ministries for help will not help, because they are often connected with one another. Families have been led around in circles by these ministers, sometimes from different denominations, only to find out they are into the same psychology. One family phoned a ministry that had a reputation of calming the nerves of children in revolt, hoping this minister would help. A lady who answered the phone was a cousin of the minister, and far too young to give wise counsel to an older couple who had raised children. In fact, the girl was not even married. She told the parents they were abusive and dictator-ish and that they should let their daughter stay out as late as she wanted to and have no limits on her life. She said if they did not do that, their daughter would climb out of a window and call the police, or go to the nearest bar and get drunk. The minister himself had written a book and offerred a course about how to control rebellious youth,, and this cousin working in his office, was giving this kind of advice! This is one of the follies of trusting in ministries instead of the Lord. One thing you can do when you see any young person on the street handing out religous literature is to walk up to him and say, "Go home. Your parents miss you. Call them, and get back with them. This is not a real life for you. You need to get married and have a home, have children, settle down to family life." Any time you find any young person in ministry, tell them the same thing. Girls will be transferred from place to place for all their youth, missing out on meeting someone to marry, missing out on children and a house to look after. Go up to these people and tell them that God can still be in their life in a major way in the realm of marriage, home and family. God admires families and it grieves him when children dishonor their parents by running away or by ignoring them. Tell them to go home. Say "Your mother misses you. Your father, too. The substitute family and substitute parents of the ministry can never give you the heritage, the loyalty, the love, that your own legal parents can give you." I have often wanted to go into one of these cults just to see how much I could refute their teachings, but I am too old and I couldn't fool them. They only want young people for free labor, whose minds are easily influenced. If you want your child back, then here are some things you might try. 1. Phone and email the ministry or minister daily. 2. Bring others to help by getting them to phone and email. 3. Start a blog to show what is happening. 4. Save all correspondence between you so that you canot be accused of neglect or irresponsiblity. 5. Send no money except a return ticket to your city, and nowhere else, when the child promises to come home. 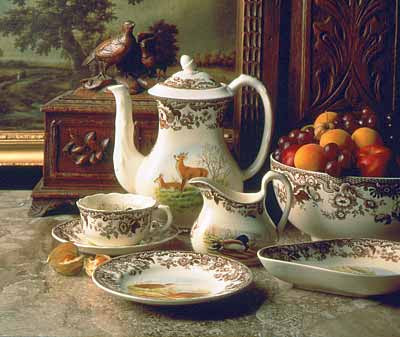 This tea set would be appropriate when the grandsons or young men (or even old men) come to tea. It is from Victorian Trading Company, which has a catolog online. This afternoon when the beds had been made and the dishes washed, I attended a tea with a friend, at a lovely shop and tea room. We had sandwiches and petit fours, which were just delicious. Things always seem to taste better if someone else makes them, so it is always a treat to be able to go somewhere for tea. I was amused at the response of the intended recipient of the basket that Margaret Hale, a young lady living at home with her parents, offered to bring. "What would we do with a basket?" she laughed. "We have little enough to put in it!" It might be hard to imagine, but it was actually not so very long ago when women did take food and gifts in baskets when they went out on their regular calls. In Jane Austen's fiction, characters like Emma and Ann were depicted carrying baskets of food and preserves when they made a call. "Calling" was a normal social event in the past. This was a time when a woman did her rounds of social calls, checking up on widows and mothers with young children, to see if they needed help. Stories of the 19th century often depict young ladies being sent with a basket to someones house. It would be lovely if some of the older girls at home would develop an interest in providing gifts like this. If young ladies would renew an interest in this lovely and worthy custom, we should all be delighted. Woven wicker baskets are not expensive, and can be purchased at second-hand stores and yard sales. They can then be painted, lined with a towel, and stuffed with a batch of fresh scones and jam. In a pinch, a basket can actually be made from a heavy brown paper grocery bag. These bags hold up to 30 pounds of groceries, and sometimes more, so they must be useful for other things. I have been enjoying finding different uses for these sturdy bags, and have come up with a makeshift basket, just by cutting along one of the creases on the folded up bag. It will not have to be returned, and it can be made quite quickly when there is a sudden need to make a call on someone, or if someone drops in for a brief visit. Sending something home with a visitor is a real treat for them. The handle is a wide strip of the brown paper, folded over several times and glued together. There is a strip of paper doily, and the markings are made with the puff paint that has been shown on other craft posts here. 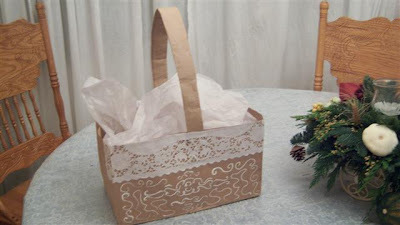 This basket is lined with tissue paper for padding, and will hold a few lightweight items. 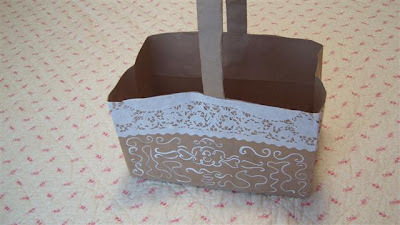 Any number of colors and designs could be used on a paper bag basket like this. If the paper bags you normally get are not as sturdy as the ones I am using, you can cut a cereal box, cracker box, or any other kind of cardboard box in half and use as a basket. Here is one decorated with little bits of things that you can make yourself. The handle and bow are wired ribbon from the dollar store, threaded through punched holes, but any kind of rope or ribbon will work. 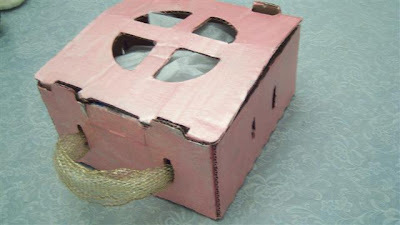 It also might be possible to make a handle out of some of the cardboard. 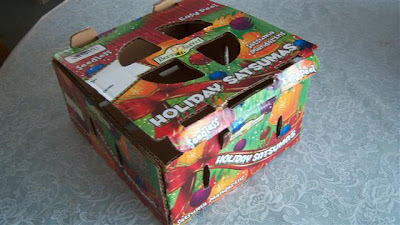 The other half of the box can be taped shut at the end, and used for another basket. Fill it with home made baked goods. If your paper bags are too thin, you may find a sturdier type of bag in your kitchen, such as one that holds flour. 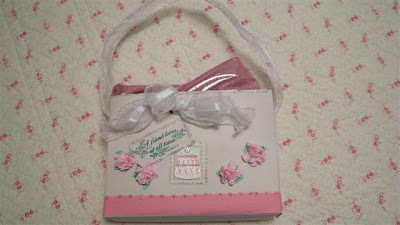 This can be covered with decorative papers and scraps and made to be quite a stunning gift bag. 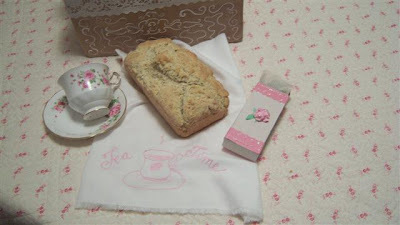 These are things in the brown bag basket: an old tea cup, a loaf of scone bread wrapped in a hand made towel, and a box of homemade tea made from fresh spearmint. 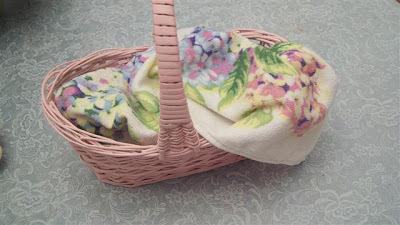 A small wicker basket (about a dollar at any yard sale or used store) painted, is just the right size for a loaf of nut bread or a few of your own jams. A gift basket does not have to be food. I have received delightful baskets from people who simply went to the dollar store and got four votive candles for a dollar, added a candle holder, a card (cards are 50c there), a doily, and a few other things, in a gift bag purchased at the dollar store. The ideas presented here are ways to use up what you have, when there is no time to shop, or gas is high and the funds are low. This is one of those very strong cardboard boxes that Satsuma oranges are packed in. It seems like such a shame just to toss them out. They can be used one more time as suitcase baskets, and they hold far more weight than the paper bag basket. This one is painted with a craft paint. There are plenty of holes in these boxes to thread wide wired ribbon through them to make a handle. I did not have time to really embellish this box, but someone with a great imagination could pull out all the stops and make one of the mandarin orange boxes look like a suitcase. Try the shabby chic technique of painting it with white folk-art craft paint or similar paint, add some glitter and scraps, and see what you can come up with. These boxes are so durable, made of corrugated card board, that it seems like we could get more uses out of them before they are thrown out. These examples are just the primitive ideas. I am sure if someone had the time, they could think of all kinds of spectacular ideas for using these kinds of bags and boxes. 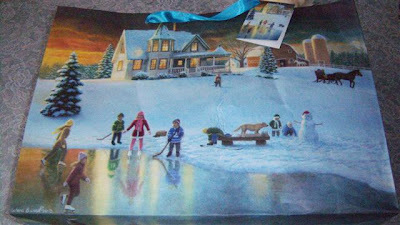 There are some absolutely beautiful art gift bags at the dollar stores these days. I do not see any point in paying more than a dollar for a gift bag. What if, for some reason, you did not have the money to even shop at the dollar store? It is good to know how to use what you have when you cannot buy something, or when you have nothing on hand to give. Dollar Tree has beautiful bags. In a previous post about charity from the home ("Charity Begins at Home") I mentioned how easy it is to for young women at home to be distracted by great ministries and neglect their own homes and families. The gift basket would be a wonderful project for young ladies who, like Margaret, the preacher's daughter, want to make a difference in the lives of others. There is always a need for such sweetness, and a girl at home could build friendships by developing a talent for giving, in this way. This kind of generosity brings out her creative abilities and helps her think outside of her self to the needs of others. If a girl put her mind to it, she could think of a long list of things to include in these benevolence baskets. Dollar Tree bags are high quality works of art, worth framing. 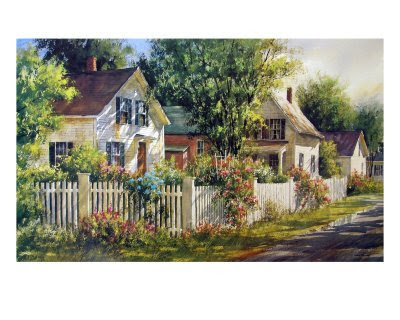 This one features a painting by Richard Burns, a contemporary artist. 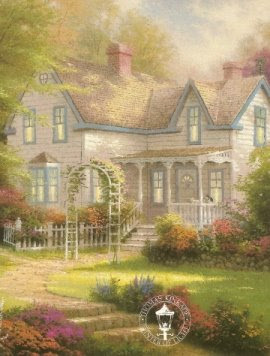 I have featured some of his cottages in past posts. My daughter stayed home and had many different interests before she was married. Her time was always filled up, and when she was not working in the home, getting meals or cleaning, she found all kinds of projects to get involved with. Young women living with their parents have a great advantage. They can develop a service to others that will never end, by reviving the idea of delivering baskets to others, any time of the year. If girls ever get to wondering "what they are going to do," they would be wise to remember the opportunity to cast a light toward someone who could use a bit of cheerfulness in their day. Just imagine what colorful things could be done with bags and boxes, and what wonderful things could be tucked inside of them---from handmade stationery supplies, to bath products, to tea cups. I have saved old calendars that have marvellous art that I do not want to throw away, so I cut pieces from them and paste them on gift boxes or bags, along with other decorations. It is also possible to make a pattern on poster board, for a bag the size of your own preference, just by tracing another bag. 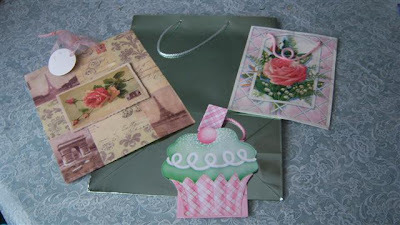 You then can use scrapbook papers or any other kind of paper, to make your own bags. I am certainly not saying that we should be too absorbed in making every single thing by hand, but I believe our sons and daughters should be able to figure out where things come from, how they are made, and how they can make it themselves. This is one way to be resourceful and rise above any financial difficulties.